Watching TV shows free online could never be easier. 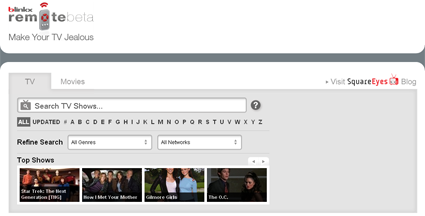 With blinkx, a search engine that scours the web for videos, watching TV shows free online is just a click away! Unlike Hulu, there is no country restricted access; blinkx links to external sites which stream the TV shows. A rather good thing for those people out of the United States. That’s right! Free access to watching any TV show free online. So what are you waiting for? Remember, the comments are open. So why not give a thanks or talk about your favorite show? Note: I may not be held responsible in any ways to your actions of using this search engine. I am simply here to inform you of the possible uses of the internet. You take the full responsibility for what you do to “Watch TV Shows Free Online”. Be aware that you may still run into the problem of country restricted access…so, right now, the usefulness of blinkx outside the United States is quite limited. Yes, websites like Hulu have country restricted access so this is a good alternative. i can't use hulu and that site uses lots of blockers so some of the stuff on there you can't watch if your out of america. Thank you. I will add them soon.